Rebecca Kaumba is on the staff at Amano School in Chingola. In the church she comes from, Lulamba CMML, she has a number of friends. One of them, Elizabeth Palata, mentioned to Rebecca that there were a lot of vulnerable children in her neighbourhood and she encouraged her to get them together and try to help them. She did and found there were more than 20 children. Bright Hope World now assists these children to go to school. Since commencing the funding for this programme BHW personnel have visited on numerous occasions. The leaders of the ministry are increasing in confidence in how they deal with the children. They have seen an improvement in the way that the guardians are relating to the children through their input. ‘Many families did not like the children, but do now that they are supported and not such a burden’. They are still having difficulties with distant relatives and uncles mistreating the children and not providing anything for them even clothes. As well as getting the children together they are now visiting them in their homes and want to increase the frequency of the meals. 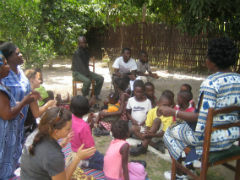 Around 15 orphans and vulnerable children in the neighbourhood of Elizabeth Palata. The fact that this ministry was commenced with their own resources, they did not wait for a donor to come, and they continued on even though there was criticism. They are not over-reaching their capacity and they keep very good accounts. Elizabeth Palata is a woman of influence. She is a retired nurse with a heart of compassion. Her husband is a retired miner and they live in Lulamba, a medium cost housing area in Chingola, Zambia. This was an area in which the mines owned all the houses. When the mines were privatised, the houses were sold off to the miners, many of then went into debt to purchase them. As the impact of HIV/AIDS increased, many of the miners died leaving families and children in houses they could not afford to continue paying for so many children ended up on the streets and in poverty. Elizabeth noticed these children and began engaging with them, she started meeting with them and feeding them. She got some friends around her and so it grew. She is like the grandmother of the community now. Bwalya is married with one child. He lives with his family and four other non immediate family members. They have a small garden to help support the family with food. He is a part time camera man. The church that Bwalya goes to is CMML, Christian Brethren Cchurch. He is a Sunday school teacher, Awana leader and also sings in the choir at church. His role in the Lighthouse Orphanage Project is as a volunteer. The issue that the community is facing is a lack of employment. Without jobs the people are failing to meet their basic daily needs. Bwalya thinks that the only way he can fix this issue is to tell people to have gardens in their backyards or even a big farming field if they can. Mwila is married with ten children; seven of the children are currently living at home. She has a garden or field that she tends to help feed her family. That is her main job, being a farmer on the family field. 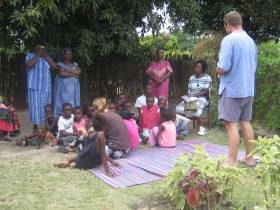 The church that Mwila goes to is CMML, Christian Brethren Church. At the church she is a Deaconess, youth overseer and a sower. She is also the vice chairlady in the Chingola Women Conference committee. Her role in the Lighthouse Orphanage Project is to be a teacher to the children. She wants to serve the children and to pray for them in her role as a teacher. • Teach the word of God, e.g. Matthew 6:33 “Seek you first the kingdom of God”. Mutiti is married with one child. He lives with his family and his brother in-law. They have a small garden to help support the family with food. He is a teacher at the government school. The church that Mutiti goes to is CMML, Christian Brethren Church. He is a Sunday school teacher, Awana leader and also a deacon at the church. His role in the Lighthouse Orphanage Project is as a volunteer. The issue that the community is facing is a lack of a place for studying and reading. Many of our youth and even adults are wasting their time drinking and playing. If we had a place where they could go and spend their time reading it would be much better. Mutiti says that knowledge is power and we can find this power in different books so if we can have a library in the community this will certainly help the girls and boys. - 15 children are being fed every three or four months. This takes place at Elizabeth’s house. - The children’s school fees are being paid in full. They also receive books, shoes, uniforms and bags. - All children attend the local CMML church and are involved in Sunday school. Elizabeth and her helpers tell them stories and lessons from the Bible. Chipeveka lives with her grandmother, father, aunty, five sisters and three brothers. Her family lives on a farm which grows maize. Chipeveka is responsible for helping to weed and hoe the ground. It takes her four and a half hours to walk to the field every Saturday. Chipeveka likes to go to school because she wants to become a teacher when she grows up. She says that teachers are humble, good people. Chipeveka’s mother died in Kitwe and that is when she went to stay with her grandmother. She has been there for eight years now. 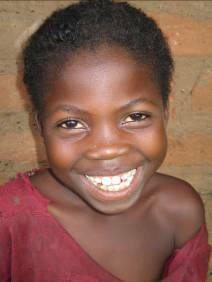 Chipeveka enjoys attending Lighthouse Orphanage because they feed her and clothe her and show love to her. They also teach about God and she learns about Jesus. When she is with her friends Chipeveka likes to play elastics or skipping. Chipeveka says that her biggest needs are for clothes, shoes, a bag and a spare uniform. She is a bright and intelligent girl and able to understand some English. Melvin is a double orphan who lives with his grandmother. Ten other cousins also live with him and his grandmother. The family often does not have enough to eat. They do manage to eat twice a day at lunch and in the evening. Melvin and his cousins help their grandmother to look after their garden. They cultivate and dig yellow maize to eat. Melvin does not like digging. The family has no other means of income and finds it hard during winter when the maize has run out. Melvin enjoys attending the CMML church. He particularly likes going to Sunday school, singing and preaching. 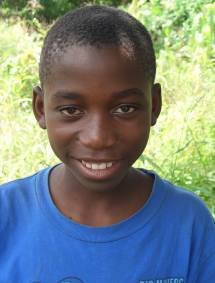 When Melvin grows up he wants to be an electrician for Zesco the Zambian electric company. Melvin walks one hour to get to Chingola Basic School. He says that he is doing well at school and especially likes science, religious education, English and maths. He likes his teachers and he has 46 students in his class. They do not have enough text books to have one each so they have to share. Melvin only has a few friends. He likes to read his school books in his spare time. Melvin says that he struggles to get clothing and blankets especially since he has no parents to buy them for him. His father died in 2001 and his mother in 2006.